This Restaurant Podium Is Perfectly Affordable! 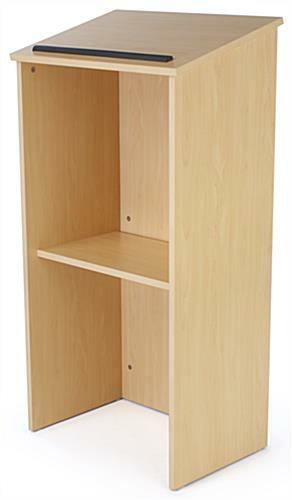 Quality MDF Construction Is Durable and Scratch Resistant! 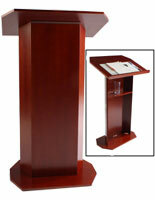 Displays2go Sells Many Other Budget Lecterns Like This Restaurant Podium In The Online Catalog! Restaurant podium is shipped disassembled to save you money! Assembly takes one person just a few minutes! Neutral coloring of the restaurant podium matches most décors! MDF construction is both durable and affordable! 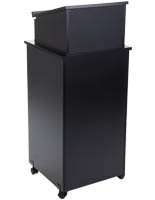 This hostess station, inexpensive restaurant podium, is a great, affordable alternative to costly pulpits and stands. The laminated construction allows for a reasonable price while still keeping an attractive appearance. 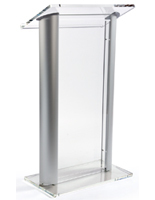 The restaurant podium, that is easily assembled, can be taken apart just as quickly to make for a truly portable lectern. 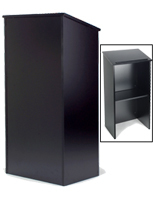 The portability and affordability make this perfect as a hostess stand in a bar, hotel, or even as a church pulpit! 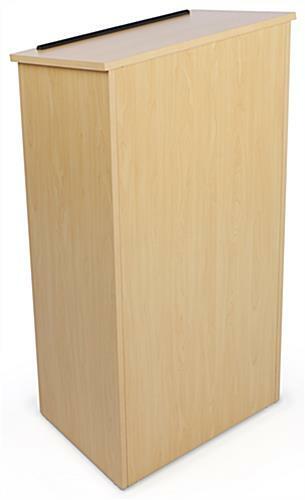 The natural maple colored restaurant podium, like other lecterns, is designed to be very versatile and is ready for use in a variety of environments. 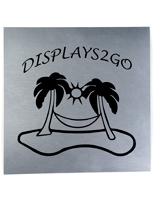 The simple design and neutral color allow for placement in any hotel, bar, or dining venue. 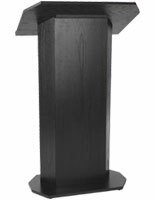 This restaurant podium that reassembles is a durable and affordable option for lecturing pulpits! 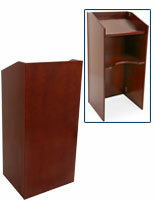 This lectern features a stain and scratch resistant, natural maple colored laminate. The restaurant podium that breaks down is extremely portable with reassembly taking just minutes! 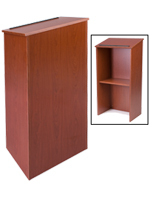 The inside shelf is designed to hold any lecturing material necessary to keep the top desk area clutter-free. The 23"w x 15-2/4"h top working desk is large enough to hold a book or laptop and features a wrist rest to keep them stable. 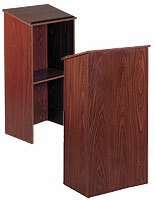 The hostess pulpit ships unassembled in one box to save money on shipping!